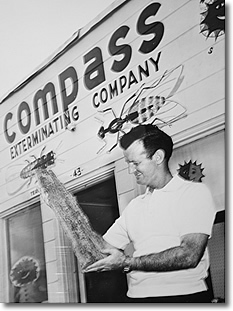 Compass treated my home for subterranean termites. Tony did a great job. He was careful and considerate of my property and exterior plants around my home while trenching and drilling around the outside of my home.. The cost Tony quoted me was competitive for this area.Thanks Compass no wonder you have been in business for 50 years! Subterranean termites are complicated to control. Even with today's management tools, termites remain a high stakes challenge. Compass Services, Inc will inspect your home for subterranean termites, and use the best chemicals on the market today to treat them, and offer you, our customer a subterranean termite bond on your home. Subterranean termites usually swarm during February through May. If you suspect that you may have termites or have been thinking it is a good time to renew the termite chemical around your home, contact us. We will send a knowledgeable termite specialist to inspect your home and give you a reasonable price to treat for termites. Compass Services, Inc also performs real estate inspections for the sale of a home. Make sure the home you want to buy does not have a pre-existing subterranean termite problem.